Greetings, and many thanks to all who attended our emotion-filled season opener concert, Convivencia Re-Envisioned. The turn-out and the response were both very fulfilling and gratifying. And the response at our little mini-concert at UT was very positive, too; so, again, thanks to the departments who banded together in convivencia to present us. And—already—we are putting the final touches on the next concert, Medieval Pilgrimage in Iberia, which is just around the bend. As that of our Convivencia concert, the music is still Iberian, but in many different Medieval styles. We, ourselves, will be on a sort of pilgrimage as our Saturday night concert is at a venue that’s new to us! St. John's Episcopal Church is intimate and has lovely acoustics! We think you’ll like it! And then we’re “home” again for the Sunday concert, at First Presbyterian Church. Whether in the new surroundings or in one of our home venues, we think you’ll enjoy this part of our EuroTour! Learn more about our program below and enjoy the audio teasers! by purchasing Season Tickets through Oct. 11! For more information, call (512) 377-6961. A company of eleven female singers explores the music of pilgrimage in Medieval Spain. This music celebrates the richly transparent timbre of treble voices in unison or in polyphonic settings, making the most of sweet consonances and pungent dissonances. Special guests Mary Springfels (vielle) and Peter Maund (percussion) join the ensemble and the TEMP Medieval orchestra of vielles, harps, and gittern. Featured soloists include Jenifer Thyssen, Stephanie Prewitt, Cayla Cardiff, Nina Revering, Erin Calata, and more! Map showing the pilgrimage routes to Santiago de Compostela. There was never a more popular time for religious pilgrimage than during the Middle Ages. In those times, people made long and dangerous trips, lasting months or years, in a search for spiritual meaning or fulfillment or as an act of penance. 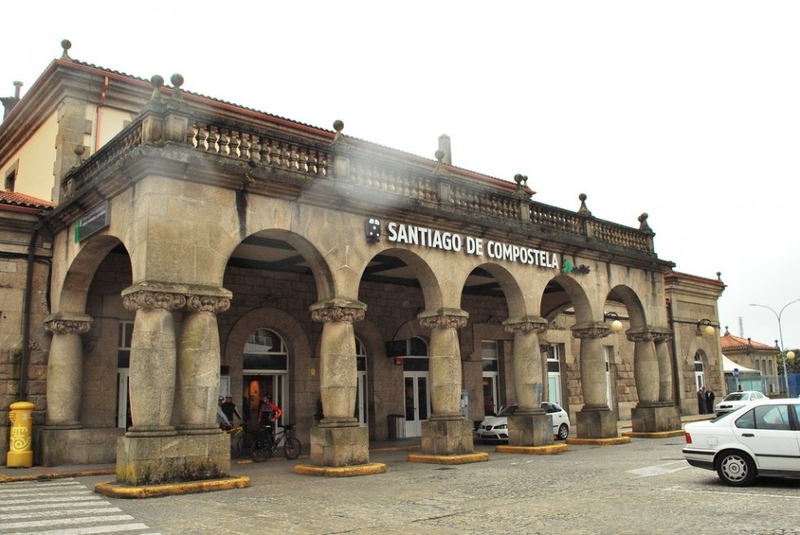 Several of the most important sites of pilgrimage during the Middle Ages were located in what is now northern Spain. The Llibre Vermell (it was discovered in a red binding, and therefore is called the Red Book) comes from the monastery at Montserrat in Catalonia. Some of the music is sophisticated, but some of it was intended to be sung by the pilgrims themselves and included chants, rounds, folk songs, circle dances, and polyphony. 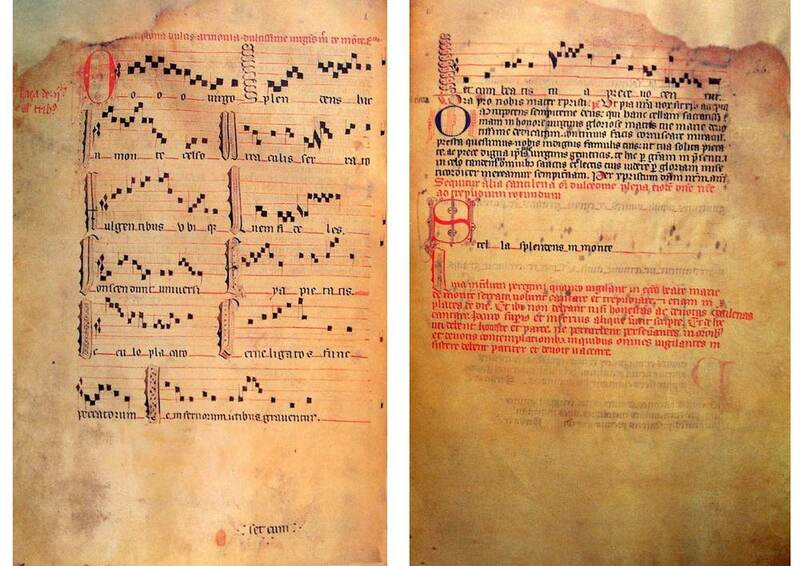 We will also perform music from the Cistercian convent in Burgos (Las Huelgas Codex), Las cantigas de Santa Maria from the royal court of Alfonso X, and selections from Codex Calixtinus, from the Cathedral in Santiago de Compostela in Galicia. Enjoy these two Llibre Vermell audio teasers from our related CDs: Stella splendens and Sacred. the long-lasting beauty of our Medieval Pilgrimage will delight you.